Just for fun, I have been trying new truffle recipes. Â I am out of good chocolate, so I can not make any more candy till we get some. 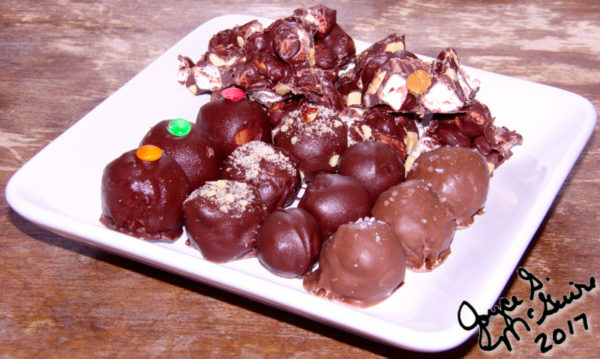 These truffles are peanut butter M&M, hazelnut/nutella, date/almond, and pretzel. Â I mixed marshmallows and peanuts with the leftover chocolate. Â My favorites were the hazelnut and the pretzel truffles. I am still looking for fun new truffle recipes and plan to experiment creating more of my own recipes. I was experimenting with cinnamon sticky rolls. 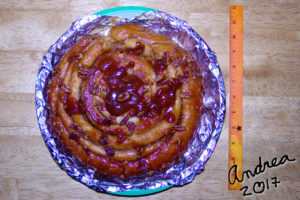 Â I was trying to make a three pound one because my Uncle Dave shared about a place that makes cinnamon rolls that heavy. I like the caramel sticky roll topping better than frosting, so I tried that instead. It is not quite heavy enough, but it is close!The roll is really good, but next time, I think I will try more cinnamon and experiment a little more. Today is NationalÂ short bread day. 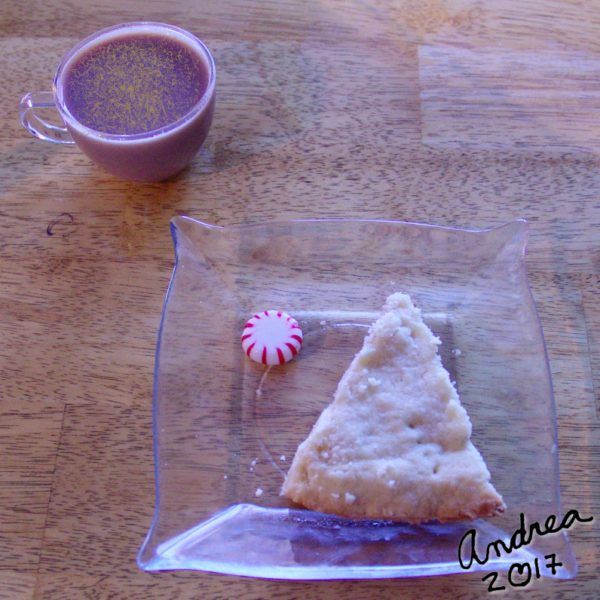 If you like shortbread, here is a great recipe from the Joy of Cooking Cookbook! Cream 1Â cup butter. Â Mix together 2Â cups flour, 1/2 cup powdered sugar and a dash salt. Â Blend dry ingredients into butter. Â Pat into ungreased pie pan and press edges down. Pierce with a fork every so often. Â Bake 25-30 minutes. Â Cut while warm. Fall is here. Here is a good fall recipe. 12 large egg whites (1Â½ cup) without any yolk in them. Otherwise it won’t work! 1 1/2 tsp Lebkucken spiceÂ or favorite recipe for the spices in pumpkin pie. In a medium bowl, whisk together the powdered sugar, potato starch, tapioca starch, millet flour, xanthan gum, and salt. This is the “flour” mixture. In another bowl, mix pie spice with granulated sugar. Taste a little before setting aside. In a large mixing bowl, start beating the egg whites. Â Add cream of tartar and continue beating untilÂ foamy. Slowly add the spicedÂ sugar, a few tablespoons at a time,Â beating only until stiff peaks form. Spoon at least a half cup of beatenÂ egg mixture into pumpkin and fold carefully. Save for a little bit. 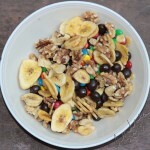 Carefully fold flour mixture into eggs about one fourth at a time, foldingÂ in until all the flour mixture is moistened. Don’t mix or be rough or the beaten eggs will fall. Now fold in pumpkin mixture carefully. 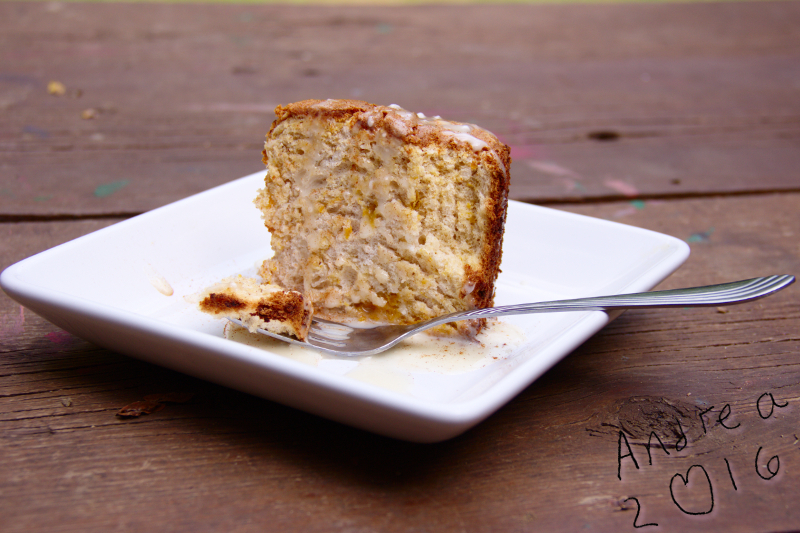 Spoon the mixture into an ungreased angel food cake panÂ andÂ make the top look pretty. Remove air bubblesÂ by carefully cutting through batter with a knife. Bake for 35 minutes, then checkÂ if it isÂ done.Â It is done when the top looks dry and springs back when touched and when a toothpick comes out clean when poked Â in theÂ middle. Turn the cake upside down and cool a few hours in the pan. When completely cool, use a knife to separate cake from pan and carefully remove it. ServeÂ with whip cream or some frosting if you want. 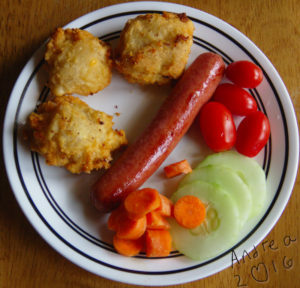 Recipe adapted from gluten free homemaker. We found a recipe for savory cheese sofganiyot in the DK Jewish Holiday Cookbook that I checked out of the library. Â It was not gluten free and I wanted to make it for Daddy. Â Here is what I came up with. Combine all the dry ingredients. Stir well and sift if desired. Cut the butter into small pieces. Cut the butter into the flours until the size of small peas. Froth up the egg white and pour with buttermilk into the dry mixture. Stir them in slowly taking care to not overwork the dough. When the liquids are incorporated into the flours, stop stirring.Â Use your hands to form a ball. Wrap in plastic wrap and place in fridge. Â We left ours for 3 days and it still worked great. 1 cup shredded cheddar cheese, we like sharp! 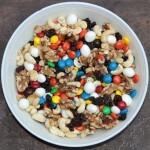 Mix filling ingredients together. Â Place a little filling in some rolled out dough. Â Seal edges well. Drop biscuits in 350 degree frying oil. Â Cook 2-3 minutes per side or till golden brown. Remove from oil and drain on paper towel lined plate. Â Sprinkle with salt if desired. 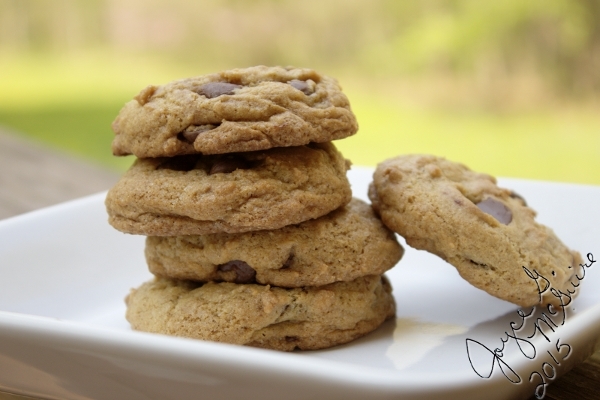 Optional: Â Use your favorite biscuit dough or even store bought dough! Â We preferred the taste of the gf rolls better though. My great grandma Bea used to make Pizzelles and share them with us.Â She would make a bunch and store them in a tin coffee can. Grandpa loaned me great Grandma’s pizzelle maker. I made some cookies and ice cream cones. Beat eggs and sugar until light yellow.Â Add butter and vanilla, beat until blended.Â Sift together flour and baking powder (and cocoa).Â Fold into butter mixture.Â If using nuts, sprinkle on top of dough before closing iron. 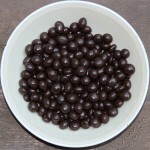 Optional:Â Use orange peel or extract instead of vanilla and add 1/4 cup mini chocolate chips to batter before baking. 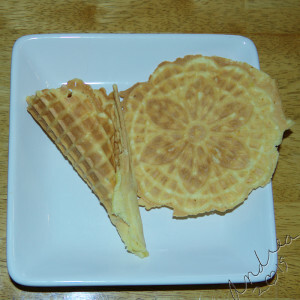 Bake on pizzelle iron as directed. We are having a gorp making contest. 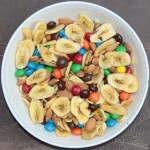 Gorp stands for Good Old Raisins and Peanuts.Â But you can use any dried fruits and nuts that you want.Â The rules were we had to make up our own recipe, or improve an existing one.Â We also had to have the ingredients in the house.Â What would you put in your gorp? Which entryÂ do you think would be the best? 4 cups raw almonds soaked overnight, drained, mixed with nibs and sugar and dehydrated till dry. 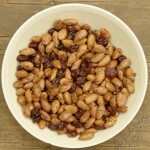 1 cup dried tart cherries-unsweetened best if you can find them! I wanted to make cookies. I wanted some thing different. So I tried an experiment. They turned out very good. Add spices to your dough when you add flour. Bake as normal. Today is Caramel Popcorn Day! If you want to celebrate, here is a recipe from my grandma’s friend, Miss Margaret. 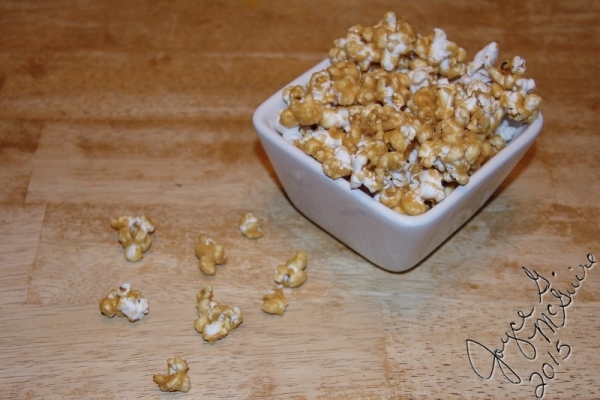 1 1/4 cups unpopped popcorn, pop your favorite way. Pop the popcorn. We have not tried this using microwave popcorn. Butter the bottoms of two large cookie sheets. Melt butter, stir in sugar, corn syrup and salt in large heavy pot. Bring to a boil, stir constantly 5 minutes. Remove from heat and stir in baking soda and vanilla. Pour over corn carefully. Stir to coat as many pieces as possible. Pour onto greased pan (two cookie sheets work well). Bake at 250 degrees for 2 hours, stirring every 15 minutes. We stirred 3 times for the whole recipe. Remove and cool. Store in airtight container. Enjoy! 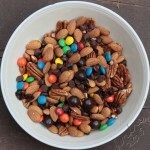 Can add unsalted nuts with popcorn if desired. P.S. Some places say 7 April is Caramel Popcorn Day, so if you missed it today, enjoy it tomorrow instead! Today is National Make Up Your Own Holiday Day. So my made up holiday is “Chocolate Covered Strawberry Day”. 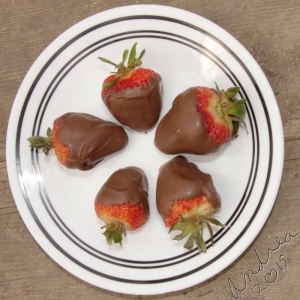 I made some chocolate covered strawberries. I warmed up some chocolate and then dunked strawberries in it. Then I let them cool. We will eat them for dessert. Have fun making up your own holiday!